The biggest disadvantage of running hybrid is the fact that it is difficult to regenerate both pools at once. There are a few reasons why. If you need poe orbs cheap in game, you can choose u4gm.com sale cheap poe currency. First, ES pool and Life pool are separate. This means that regen/leech maxes are calculated separately for both. On a hybrid pool, it may be easier to reach 7k EHP with 4k ES and 3k life. Second, gearing requirements become increasingly steep because you want Life, max ES and % ES on gear. This isn’t particularly easy to gear for because you’re looking for a more specific set of affixes. Third, this ties into the first, is that you want a method to regenerate both ES and Life. The easiest way is to use ZO / Ghost Reaver to regenerate ES and flasks to regenerate Life. Fourth, this ties into both reasons 1 and 3, is that ES takes damage before Life. This is a big deal because it means that whatever you gear for Life regeneration is largely going to be wasted because ES is always going to take damage before Life. Fifth, is Chaos Damage. Because your life pool is split across ES and Life, you have a lower effective health pool against chaos damage. The primary advantage of going hybrid is the larger amount of EHP available to your character; however, this isn’t exactly unique to hybrids since a MoM-based character that invests in both mana and life nodes will get comparable benefits with none of the disadvantages of the hybrid character. Your solution addresses problems 3 and 4, allowing a hybrid character to easily gain access to Life + ES leech at the same time, and allowing characters to leech ES when necessary and Life otherwise. But it still misses the main problem of hybrid characters which is a lower amount of regeneration due to it being split across two different “health” pools. In fact, having a lower amount of regeneration is a really big deal for hybrid characters, because regeneration accounts for a significant part of survivability and defense. The advantages gained for going hybrid are not worth the disadvantages, especiailly with MoM being the way it is. 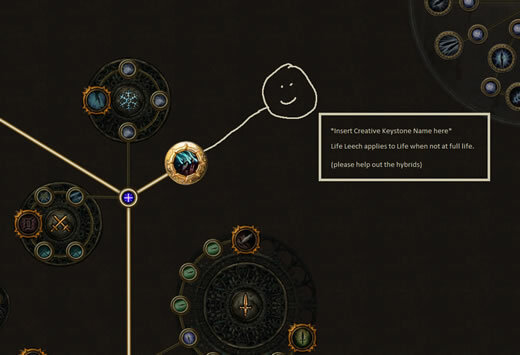 To be honest, I feel like the Full Life / Not Full Life toggling effect you are proposing, and which already exists on Soul Tether is not a perfect solution because it doesn’t account for the fact that % regen or leech is weaker due to splitting your EHP totals across two different pools. That being said, it is entirely possible to build hybrid characters using Occultist or Trickster, but their viability is extremely limited and niche.